Yes!! I’m so excited that Project Runway, Season 13, is back on Lifetime, kicking off later today. I always look forward to blogging about PR and the amazing interactions I have with fellow PR fans. But before the 1st episode tonight, I thought I would put together a little introductory post. First up, let’s discuss the “Runway Redemption”! PR decided to bring back the “Runway Redemption” twist from last season, which gives a previous designer the chance to get back in the workroom. One change for this year is that with the return of a previous designer, it will make for a total of 19 total designers competing. 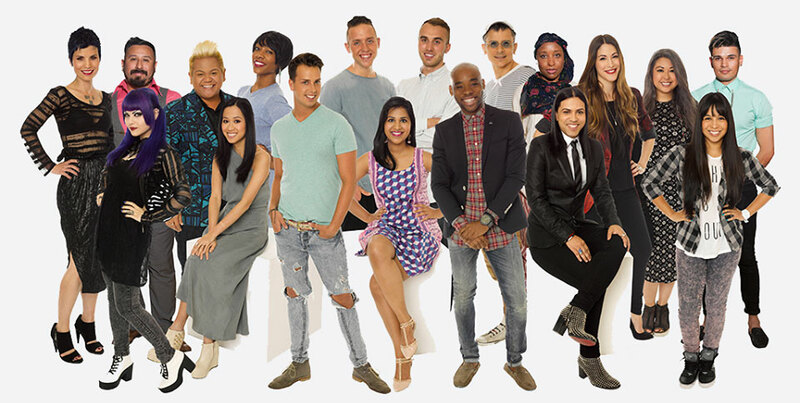 But in reality there is 1 final audition for this group of designers and 3 will not make the final cut. Last year’s recipient, Katelyn Pankoke, and her chance for runway redemption, was a bit more full-proof. But this year, with 3 designers being cut so quickly, will a full runway redemption happen?? My prediction is yes, since the 3 who are competing for the runway redemption are already familiar with the PR process. 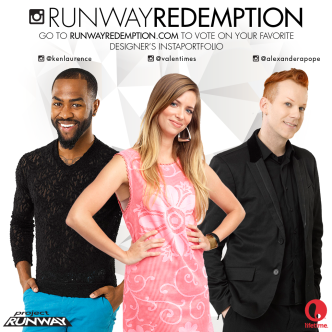 The 3 designers who competed for America’s votes were Ken Laurence (Season 12), Alexander Pope (Season 12), and Amanda Valentine (Season 11). Kate also took part in Season 11, you know, the one with all of the forced team competitions. That season to me always seemed a bit unfair. I still contend it would have ended differently had the designers not been eliminated based on the bottom group. There were always a couple of designers in the higher scoring group who were only saved because they were in the top group. Because of that, I rooted for Kate to have a real shot at the title and so with that, I also rooted for Amanda. But it’s anyone’s guess and I imagine whomever America chose will be a force to be reckoned with during Season 13! Another major PR twist is also returning — the Tim Gunn Save! Justin LeBlanc received the save last season so I wonder who, if anyone, might be awarded the save this year. 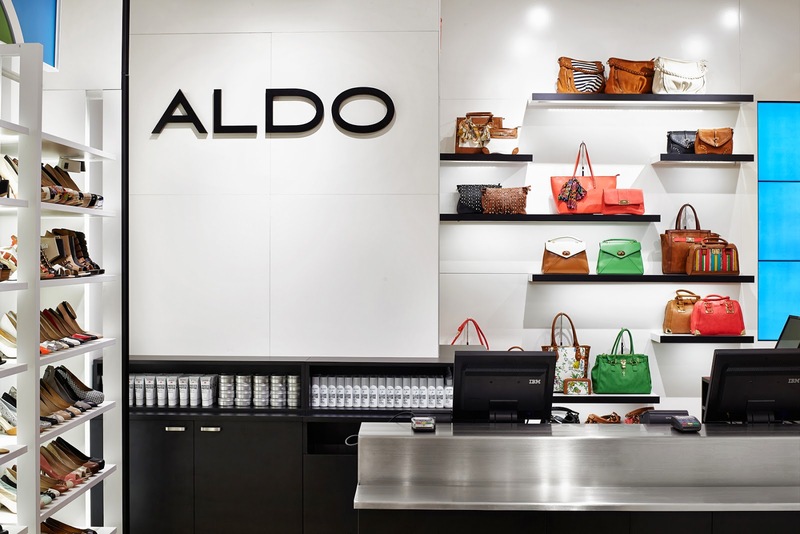 Also in store this season is the ever-famous and popular accessories wall and this year’s sponsor is ALDO. No Michael Kors again, but everyone else is back as per norm — Heidi Klum, Nina Garcia, Zac Posen, & Tim. In addition, there will be some huge guest judges joining “Project Runway” this season — Emmy award winning “Modern Family” actress Julie Bowen, Golden Globe winner Elisabeth Moss from “Mad Men,” Shay Mitchell from hit series “Pretty Little Liars,” Olympic gold medalist downhill skier Lindsey Vonn, entertainer Dita Von Teese, fashion designer Christian Siriano, British television personality and renowned photographer Amanda de Cadenet, and YouTube celebrity Bethany Mota. Alexander Knox — I see Alexander likes to play with volume and is a little more on the avant garde side. Will timing be his downfall? Can he create RTW? Angela Sum — Angela clearly has done bridal & already had some runway experience. This should be a huge advantage for her in this process. Carrie Sleutskaya — A designer who creates both womenswear & menswear — huge plus! Char Glover — A little lacking in past work examples compared to other designers so will this impact her longevity in the competition?? Emily Payne — Designs with comfort & wearability, but can she design at a higher level of fashion?? Emmanuel Tobias — Looks for men, looks for women — I’m seeing someone who can definitely put on a show! Early fave, maybe so! fäde zu grau — A streetwear/urban designer, very different, I wonder how he will fare in the competition. Hernan Lander — He has presented during NYFW/MBFW. I’ve even been invited to his shows, but was not able to attend to see his work firsthand. But I expect he can go far in this competition. He’s already had celebs wear his pieces too — Rumer Willis?? Jefferson Musanda — I see he can create his designs, but he might have to step it up for PR — peplum & drop crotch pants won’t be enough for the win. So can Jefferson push it to the max?!? Korina Emmerich — We know Nina loves a good jacket and/or coat — will these 2 be Fashion Besties! Kini Zamora — He seems to have a great range so it should translate nicely on PR. Kristine Guico — She’s not afraid of bold prints or daring silhouettes, but will the judges be fans? Mitchell Perry — Another designer with a wide range, but will his POV come across clearly to the judges? Nzinga Knight — On the other hand, a designer with a clear POV, but will the judges love it? Samantha Plasencia — Editorial, made for print, also some looks for men, another who should be ready and raring to go for this grueling PR process. Sandhya Garg — A woman who can design for women, but another one I could see who may need to step it up for this design competition, push the boundaries more. Sean Kelly — 1st designer of this bunch who designs for men, but I didn’t see any pieces for women, yikes! Tim Navarro — A lot of versatile designers in this bunch, including Tim, who design for both men & women, handles on separates — should make for an interesting season! $100,000 from Red Robin to launch their business and the opportunity to design a fashion accessory for all the Red Robin servers — NOT SURE ON THIS PRIZE STILL, NO CAPSULE COLLECTION OR DIRECT WAY TO GET A DESIGNER’S 1ST PIECES TO CONSUMERS & FANS?? Best Western International will also provide the winner travel and hotel accommodations to fashion capitals and inspiring locations around the world — IS THERE A BEST WESTERN THEN IN MILAN, PARIS, GUESS SO! The winning model will also appear in the winner’s fashion spread in Marie Claire magazine. This entry was posted in Reality World and tagged Alexander Pope, Ken Laurence, Lifetime, ProjectRunway, Tim Gunn. Bookmark the permalink. ← What Did Day 3 Look Like At #MBFWSWIM 2014?! ?